On March 20 1932, Phar Lap won the world’s richest horse race – the Agua Caliente Handicap of $US 50,000 in Mexico, within 24 hours of the opening of the Sydney Harbour Bridge. America hailed the records of Big Red, the galloping kangaroo. Both achievements had been Australian success stories during the bitter times of economic Depression, and followed Don Bradman’s World Record score of 452 not out. Bradman has gone, that record has gone, but the Bridge still stands – and Phar Lap too. After his death just 16 days after beating America’s greatest horses, his owners decided to “celebrate” Big Red in a stunning trifecta of souvenirs. The 14lb heart was preserved, bottled and sent to the National Museum of Anatomy in Canberra (now in the National Museum of Australia), while his hide was taxidermied and sent to the Museum of Victoria. His skeleton was sent to the Dominion Museum in New Zealand. All this to satisfy the public interest circa 1933! Phar Lap has since become ultimately collectable, positively totemic, and not just in Australia. In July 2003 racing collectors in the USA were offered the lucky kangaroo-skin saddle that jockey Bill Elliot had ridden Phar Lap to win at Caliente, and had gifted that year to fellow-jockey George Woolf, who had used this saddle in all his rides on the great American horse, Seabiscuit. The saddle sold for nearly $US 150,000 and is now on loan to the National Racing Museum & Hall of Fame. Despite this fact, another Elliot saddle was purchased for $87,000 last year in Melbourne in a joint effort by the Federal Government ($25,000), the Victorian Government ($50,000) and the Australian Racing Museum. Described as the saddle used by Bill Elliot to win “seven races from seven starts”, it would appear that Phar Lap must have been doubly mounted in Mexico! The absolute reverence for Phar Lap memorabilia can be easily established by the fact that simply so little enters the market, till now. In Lawson Menzies auction on Aril 4 fourteen personal items were uncovered in far north Queensland – a silk blouse race-worn by both Jim Pike and Elliot, Elliot’s own inscribed racebook for Agua Caliente, sections of the floral presentation, and over a dozen photographs on card of the Final Event. Lawsons rceived from New Zealand the original sale catalogue for the Annual New Zealand Thoroughbred Yearling Sales at the Trentham Racecourse, January 24 1928 as produced by Pyne, Gould, Guiness Limited. This announced the offering of Lot 41, an un-named colt sired by Night Raid out of Entreaty - and Mr Gould has heavily annotated throughout regarding each sale. He has noted Harry Telford's purchase of Lot 41 for 160 guineas - and a later addition notes "Phar Lap winner Juvenile at Rosehill" (27.4.1929). Certainly this is as close a moment to Phar Lap’s “birth” as anyone can get. One of the pleasures of going through original race books is the explicit panoramic at-the-post photographs, and excellent details for the front-runners. Maurice McCarten’s proved to be no exception with his albums for 1923-28 showing the champion New Zealand jockeys winning streak, alongside wonderful portraits of McCarten with Jim Pike, Phar Lap’s most famous jockey. Pike had died penniless in 1969, so there are no commemorative signatures of his. However Big Red’s first winning jockey, Jack Baker, signed a limited edition of 350 photographs that celebrate that first victory at Rosehill in 1929. It was Baker’s only victory and after a succession of jockeys, Telford found the horse running hot from September 1929. The silks we received from the first Mrs Elliot, was race-worn by both Pike and Elliot in 1929 and 1930. It’s a deep red racing blouse, with black and white armbands, with some fraying to the silk sections of both lower sleeves, and evidence of mud there too. After going over the evidence and the oral record, this silk was race-worn by Pike when first on Phar Lap in the AJC Derby (5.10.1929), the Victoria Derby (2.11.1929), and again first place in the VRC St Leger Stakes (1.3.1930). It was then handed on to Bill Elliott when Phar Lap won the Governor's Plate (6.3.1930), the King's Plate (8.3.1930), the Cumberland Stakes (23.4.1930), the AJC Plate (26.4.1930) and the Elder Stakes (10.5.1930). Pike's next ride on Phar Lap was the King's Cup on 17 May 1930, where a new slim-line blouse with three black bands was on show (see the Referee, March 21). 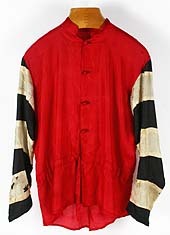 In all probability Telford passed these silks between his other jockeys in 1929, which would add another two first place rides for Big Red, but my feeling is that Telford held on to the silks used by Lewis when riding Phar Lap in the 1929 Melbourne Cup. Anecdotal evidence and family lore has it that Elliot took these silks in his luggage to America, intending to use them. On finding another horse with similar colours, Phar Lap changed colours for that one last ride. Amongst McCarten’s racing items was an original sepia photograph of Night March winning the 1929 Melbourne Cup, ahead of Paquito (McCarten) and Phar Lap (Lewis), inscribed thus to reverse in McCarten’s hand. Maybe it is worth only a few hundred dollars, but it certainly meant more to the jockey himself, having outgunned the wonder horse. Pike finally got Big Red way over the line in the 1930 Melbourne Cup, and souvenir tinplates of the pair were created by Agnew & Company that Christmas. The jockey had won 22 races in a row on Big Red, before coming 8th in the 1931 Cup under a horrible weight. This prompted Telford to take the horse to America, whereby he wrapped up his Randwick stables. Jim Pike then passed on the small zinc alloy stable nameplate to his favourite barber, Carl Phillips in Zetland, who put it on a lean-to in Leichhardt for over twenty years, before providing it with a cupboard out of the driving rain. Another unique item was an original Agua Caliente race book for March 20 1932. Bill Elliot's copy of the Official Program of the Agua Caliente Jockey Club should not be confused with the pre-race souvenir booklet that is in the Museum of Victoria, which shows the race being billed as a $100,000, which was then halved as the Depression hit the racing industry. Elliot had folded over the 18 page program to Race Thirteen - the Agua Caliente Handicap, and noted the first four place-getters and Phar Lap's record race-time. He also pasted the program down on a section of the hard floral presentation card he received after the race, and while Race Thirteen is rather sunned, it has protected the race program front page, with its clear inscription: "To my Darling Wife, with best love from Bill." Surely this is the ultimate association copy. With the silks came a lovely bundle of original sepia photographs, each approximately 16.4 x 12cm, each pasted down on card, numbered and dated "3.20.32 A.C Handicap - 50,000 Added". Each showed scenes from Phar Lap's last race, in which Big Red beat America’s favourite Reveille Boy, who had just won the Kentucky Derby. Four of these covered developments in the race, while another group show Elliot on Phar Lap, with strapper Tommy Woodcock, directly after the race. There’s Phar Lap being led over to the floral presentation by a jubilant lanky Woodcock, and the fourth group shows jockey Elliott surrounded by well-wishers, including the owner David Davis, and Hollywood actress Billie Burke. Davis had film connections in California and had arranged with Laski & Co to film the race to promote the horse in future races across America. I find the original hand-written presention card, about 16 cm across, rather poignant: "AGUA-CALIENTE HCP & FLORAL PRESENTATION - W. Elliot (up - March 20th. 1932" Hastily done, Phar Lap fails to be named despite being hailed as the World’s greatest galloper by such public figures as Damon Runyon: “Suddenly he began covering ground in great leaps like a mammoth kangaroo and he soon overhauled the field and won by much open daylight.” And that was from last out on his first dirt track! Newspapers worldwide took a great interest in the race. A special issue of the Australiasian for 26 March 1932, included colour pages on the Sydney Harbour Bridge opening, a full page on Phar Lap in Colour, and the article, Phar Lap The Wonder Horse on the Agua Caliente race win. Phar Lap: The Record Breaker was the first and rarest book on Phar Lap, written by Jack Spinty, and published by New Century Press "within a few days of the death of Phar Lap" from its offices under the Southern Pylon of the Bridge itself. This 64 page booklet included nine full page photographs, a poem by Colin Wills, together with Phar Lap’s full pedigree full pedigree and race results to Agua Caliente. It also proved to be extremely rare. The National Library of Australia finally received a copy in December 2004 by donation. The State Library of New South Wales has had to make do with a 1987 reprint. Also unusual is an amber glass trophy of Phar Lap's head, about 13.cm high on an oval base, with raised letters 'PHAR LAP' and '1928-1932' on one side, '37 wins from 51 starts' on the other. One of only eight known to have been made in 1932, this one was in perfect condition and was owned by Sydney bookmaker Joe Taylor. While others have been sighted, they usually have chipped ears, but hold fragments of their green felt base. Originally fitted within a small cedar box, this edition was made by WJ Smith of Australian Glassworks as a memento to a select few in the racing fraternity.